COLUMBUS - State Senators Steve Huffman (R-Tipp City) and Brian Hill (R- Zanesville) announced today the unanimous Senate passage of their legislation that would create an industrial hemp program in Ohio administered by the Department of Agriculture. COLUMBUS - State Senator Steve Huffman (R-Tipp City) will host a ceremony on Friday, April 5, 2019 dedicating a portion of State Route 55, located in Miami County, as the "Lance LCpl Marc L. Cole Memorial Highway." 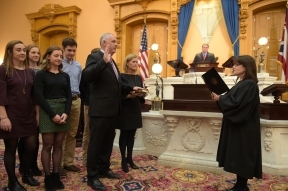 COLUMBUS - State Senator Steve Huffman (R-Tipp City) today announced that the Ohio Legislative Service Commission is accepting applications through April 1, 2019 for the 2020 Legislative and Telecommunications Fellowship Program. The Commission will hire 24 fellows to serve in the Ohio General Assembly for the 2020 calendar year. COLUMBUS-State Senators Steve Huffman (R-Tipp City) and Brian Hill (R-Zanesville) today introduced legislation that would create an industrial hemp program in Ohio administered by the Department of Agriculture. COLUMBUS - Ohio Senate President Larry Obhof (R-Medina) today appointed State Senator Steve Huffman (R-Tipp City) to several key Senate committees for the 133rd General Assembly.